UPDATE February 2011: A better way to do this has been added at the end. An email came. I could get a set of one of my all-time favorite commercial speakers at “a ridiculously low price.” Would I be interested? I did not hesitate. Rewind. If you were to make a short list of the all-time best speakers in the “cone-in-a-box” paradigm, certainly the NHT M3.3 would be there. The design was a mix of the conventional (four-way floor-stander with plastic cone drivers, metal dome tweeter, passive crossover) and some very innovative thinking. Rather than rehash the logic behind the angled front baffle, the side-firing woofer, and the obligatory against-the-back-wall placement, I’ll refer you to the reviews in The Audio Critic and Stereophile. 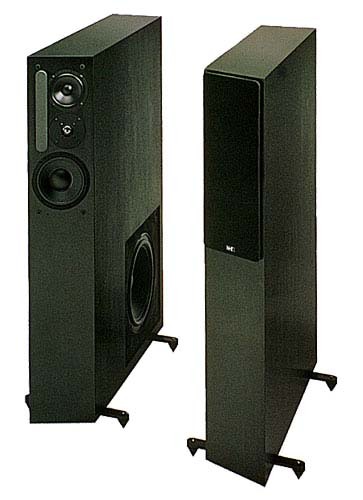 I had heard these speakers on a few occasions and was always impressed; though I’ve owned and built some pretty decent speakers, these seemed to do things well that mine couldn’t. The dynamics seemed totally unrestrained, the spatial definition astounding- it was easy to hear every mistake and manipulation by the recording and mastering engineers. Though I was a devotee of electrostatics, I thought that if I had to live with cones-in-a-box, I could be pretty happy with the M3.3s; they certainly sounded at least as good as any other conventional system I’d ever heard. And to be perfectly honest, I was an NHT fanboy- I have always admired the solid engineering and non-mystical approach to loudspeaker design, along with their consumer-friendly pricing. Though the company was pulled in several directions through the years when it was being passed back and forth between owners, the quality and ingenuity of their products remained high. Jack Hidley, one of the M3.3’s designers, was cleaning out the NHT warehouse and put their surplus stock of drivers on sale. I bought the midrange and upper bass units for the M3.3, with the intention of finding some 1259 woofers and a reasonable replacement tweeter and cloning them. Jack was very helpful and made some suggestions on how to pull it off. A few weeks later, he ran across some relic M3.3s and remembered me. These particular units were warranty returns that had gone partially silent during a sonically abusive party. According to Jack, it’s pretty hard to burn out the drivers, and the greater likelihood was that some crossover components would have to be replaced. Besides which, I had already bought several driver sets, so if any needed to be replaced, I could do that. And the cabinets would save me a ton of time and effort. Jack and I dickered over the price for about 10 seconds before reaching accord. Without hesitation, I grabbed these beauties and ran like a bandit before he changed his mind. Gilding the lily, Jack casually mentioned that he had worked out some modifications to the speakers, specifically addressing the weak point in any subwoofed design- the woofer to upper-bass/midrange. Well, well. Of Course I had to do this. And this is the story of Jack’s Superized version of the M3.3s, with one or two little twists. Being who I am, I cannot leave well-enough alone. Though the M3.3 was claimed to be designed without compromise, of course there are some. And the biggest compromise is running the speaker full range from a single amplifier. Anticipating this, the NHT engineers provided a simple way to separate the upper section from the lower; the low-pass crossover to the Foster 1259 woofer and the high pass crossover to the rest of the drivers were brought separately to individual pairs of rear terminals. For normal use, the two terminal sets were strapped in parallel. To bi-amp, the user would remove the straps, run the preamp outputs to two separate power amps, and run the output of each power amp to the corresponding speaker terminals. This way of bi-amping is foolproof, too, because this separation leaves all of the original passive crossover in play- the crossovers are exactly as they were, so the user can only screw things up by setting the relative levels incorrectly. The passive crossovers take some of the load off of each power amp, since the impedance presented to their respective power amps is quite high outside of their pass-bands. But foolproof as it is, the built-in bi-amp method is compromised. For example, if one wants to use a powerful bass amplifier that requires low-pass filtration before its inputs (for example, the 500 watt VT-3 amp by Sunfire that I wanted to use), the amp MUST be presented with a signal containing no high frequencies or Bad Things Happen. Another example is using a tube amplifier as the amp for the upper section- it will still see lots of low frequency signal at its input, but the rising load impedance at LF can cause severe problems to the output transformer (tube amps do NOT like to be run full steam into an open circuit!). And one of the biggest advantages of bi-amping, the tighter coupling between drivers and power amp output, is thrown away. One interesting compromise in the stock M3.3 was the woofer-to-upper-bass transition. If you look at the frequency response curves of the individual drivers, you can see that the woofer rolls off at 12dB/octave (2nd order) for a low-pass, and the high-pass response for the upper bass driver is 24dB/octave (4th order). Why the unsymmetrical slopes? The answer appears to be “phase.” The setback of the woofer from the plane of the other drivers is on the order of a meter. So there’s 3ms of an all-pass delay with respect to the other drivers. This corresponds to something like 100-110 degrees at crossover, which is not desirable. In theory, a passive LC all-pass could be used to compensate for this and allow the use of a more symmetrical transfer function; this will smooth out the in-room bass lumpiness around the crossover region to a surprising degree. But such a line would be really, really big, and really, really expensive. With biamping, of course, an all-pass is incredibly cheap and easy to implement. So we can neatly remove THAT compromise, too. So, let’s see how to do all of this, and keep our eyes open for other potential improvements along the way. The crossover circuit for the stock M3.3 is shown here. The low-pass crossover to the 1259 woofer is usually on a separate board and is strapped in parallel with the crossovers used for the upper section by the external jacks; the upper three drivers’ crossover inputs are wired in parallel on the main crossover board. As usual for an NHT design, the parts chosen are absolutely suitable for the intended purpose; substitution of designer parts would increase the price and very possibly degrade the performance. The measured impedance curve can be seen to be a very kind load for a power amplifier- impedance compensation is cannily chosen to minimize the roller-coaster ride of impedance magnitude. In-room SPL response is quite flat; at certain heights, I can see a notch at 4kHz, but otherwise, it is exemplary. Years ago I was a speaker builder. Unlike many I actually had a good paying engineering job and I could afford the best parts, speakers and material available. I took a job overseas and forgot about some storage and hobby stuff tucked away in a x-relatives house. Recently this year (2014) I was pleasantly surprised how nice air conditioned clean storage keeps things. Specifically I have two perfect NHT 1259 woofers I do not need. These are the original ones that Madisound use to sell not the chinese copies. I will give someone great joy if they need these – still the best home 12″ sub ever made. Any chance you still have the 1259’s for sale? hey Raymond Steele I know this is a long shot but I would gladly take those NHT woofers off your hands.. I will pay top dollar thanks.